Paul Baker is a producer, editor and director. 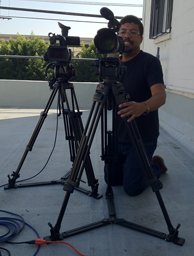 With more than fifteen years of professional experience, he has edited for television, and produced and edited several documentaries and numerous behind-the-scenes documentaries for the major studios, as well as music videos, promos and tv spots. He is an active member of the Producers Guild of America, and he holds a Fine Arts degree from the San Francisco Art Institute in photography and filmmaking. The most valuable element Paul brings to every project is his inate storytelling knowlege and his passion and inveterate curiosity.